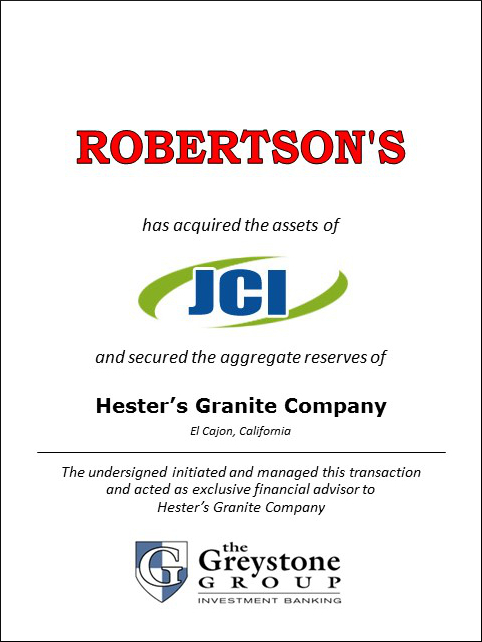 Greystone Group Advises Hester's Granite Company and J Cloud Inc.
SAN DIEGO (August 1, 2011) – The Greystone Group announced today that it served as exclusive financial advisor to Hester’s Granite Company in the sale of J. Cloud Inc. and the lease of Hester’s Granite Quarry to Robertson’s Ready Mix. “We have enjoyed working with Joel Cloud and his family over the past 10 years and were pleased to be able to represent them in the transaction with Robertson’s Ready Mix” said Tim Oitzman, President of Greystone. Hester’s Granite Company owns 94 acres of land in San Diego County containing approximately 24.1 million tons of fully permitted aggregate reserves. Prior to the transaction with Robertson’s Ready Mix, the quarry had been leased to Lehigh Hanson (or its predecessors) for over 15 years. Robertson’s Ready Mix is the largest privately owned, integrated producer of aggregate and ready mix in the United States and is the largest producer of construction materials in Southern California.